FINS, which is short for Family in Need of Services, are cases that begin in the juvenile court in a few different ways. FINS cases involve court supervision of a juvenile who has committed misconduct that does not fall under the category of a criminal offense. FINS cases also include cases where the caretaker of the child has caused the child's misconduct, or has failed to cooperate with the child's school regarding truancy or other education problems. 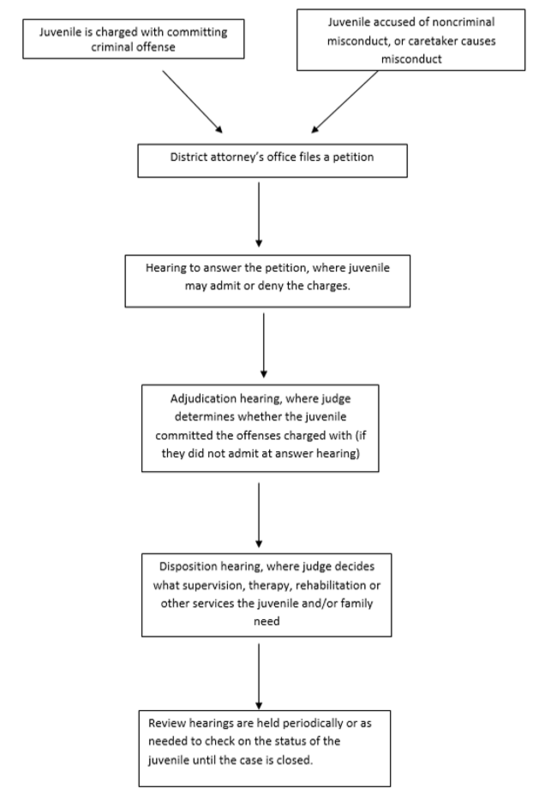 Children are appointed attorneys to represent them in these cases, and these cases follow a similar process as the delinquency cases described above, and in the table below. As part of the disposition in a FINS case, a juvenile may be placed in the care of someone other than the parent(s) or caretaker, but are not placed in secure care such as a detention facility. Answer - a court hearing after the petition has been filed, where the juvenile may admit to all the claims the district attorneys has made, or deny them. If the juvenile denies committing these acts, the case will be set for an adjudication hearing. Adjudication - this is what they call a trial in juvenile court. It is the court appearance where the district attorney's office must try to prove the minor committed the acts he or she is accused of. ATD - short for alternatives to detention. Instead of keeping a juvenile in a secure facility, such as a detention center, the court may pick an option that still allows the juvenile to live in the community. This includes electronic monitoring and trackers. This program is used prior to adjudication, and can be a condition of the bond or instead of a bond. Child - in delinquency cases, a child is someone younger than 21 who commits a delinquent act before turning 17 years old. Competency - before a juvenile can be adjudicated for an offense, the juvenile must be able to understand the process and be able to help their attorney at the adjudication hearing. If it is determined that the juvenile cannot- either because of mental illness or developmental disability- the child is found to be incompetent. The court will then decide if the juvenile can be found competent or restored to competency after classes, or if they are permanently incompetent. Continued Custody Hearing - if a juvenile is taken into custody, much like when an adult is arrested, but not released back to their parents, a hearing must be held within three days. This hearing is the continued custody hearing. Defense Attorney - the lawyer who works for a juvenile accused of committing an offense. Delinquent Act- a delinquent act is an offense that would be a crime if committed by an adult. Disposition - similar to sentencing in adult court, the Judge will decide at disposition what sort of treatment, supervision, or rehabilitation the child needs- such as community service, restitution, probation, or placement in secure care. Diversion - program run by the district attorney as an alternative to being prosecuted in juvenile court. If the juvenile successfully completes diversion, they are not adjudicated for that offense and the case against them is dismissed. DJS - Department of Juvenile Services, provides probation resources and supervision to juveniles. Drug Court - a program within the juvenile court system designed for juveniles who are substance abusers. Juveniles in the program are supervised by probation officers, have frequent testing to see if they're using alcohol/drugs, and have many weekly court hearings before the Drug Court Judge. EMP - electronic monitoring system that allows a probation officer to monitor whether a juvenile is at home/school when they are supposed to be. This program is used prior to adjudication, and can be a condition of the bond or instead of a bond. Expungement - process to have the records of an arrest or a finding of delinquency destroyed. If your record is "expunged" no record of ever having been involved with the juvenile court system will exist. Felony Grade Delinquent Act - an act that would be a felony if it were committed by an adult. An act is a felony for an adult if it could be punished by hard labor - that is, by being sent to a state prison. Youth cannot be punished at hard labor, but it is still sometimes important to know whether an act is felony-grade or misdemeanor-grade. IDB - short for indigent defender board. This term is commonly used to refer to the attorney the court appoints to represent the juvenile. Misdemeanor Grade Delinquent Act - an act that would be a misdemeanor if it were committed by an adult. An act is a misdemeanor if it is not a felony - that is, if it cannot be punished by hard labor for an adult. As a general rule, a youth cannot receive a disposition - or sentence - lasting longer than six months in custody or two years on probation for a misdemeanor-grade act. OJJ - short for the Office of Juvenile Justice, which is an agency of the state of Louisiana. OJJ runs all of the secure and nonsecure custody facilities in Louisiana. Parole - if a juvenile has been sentenced to secure care, such as a detention facility, that juvenile may be allowed to be released earlier than the period of time ordered. The Department of Safety and Corrections Office of Juvenile Justice makes the decision as to whether a juvenile may be paroled. Probation - a youth can be given probation as a disposition - that's like a "sentence" - after he or she is adjudicated delinquent. Probation usually means that the youth has to follow rules that the Judge makes, but gets to live at home. Petition - a written request filed in Court by the district attorney's office that claims a juvenile committed misdemeanor or felony grade acts and asks the Court to hear the case and make a decision. Public Defender - A defense attorney who works for juveniles who can't afford to pay for a lawyer. Public defenders work for their clients, not for the court or the state. Rivarde - Jefferson Parish detention facility located next to the Jefferson parish Juvenile Court. Restoration - process where a juvenile who has been found incompetent attends classes to inform him or her about the court process so that they may participate in their case. Trackers - program used by court to monitor juvenile prior to adjudication instead of holding the child in custody. This can be done as a condition of bond or instead of bond.